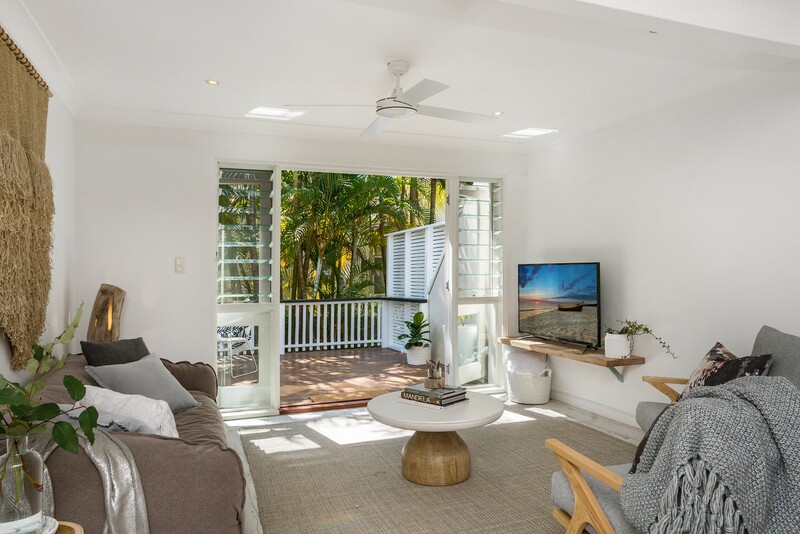 Minutes from Clarkes Beach and the cosy cafés and shops in Byron Bay, Banjo’s on Paterson is tailor-made for laid-back beach holidays. The open-plan living area and modern galley kitchen open onto the private north-facing deck for a seamless alfresco lifestyle. 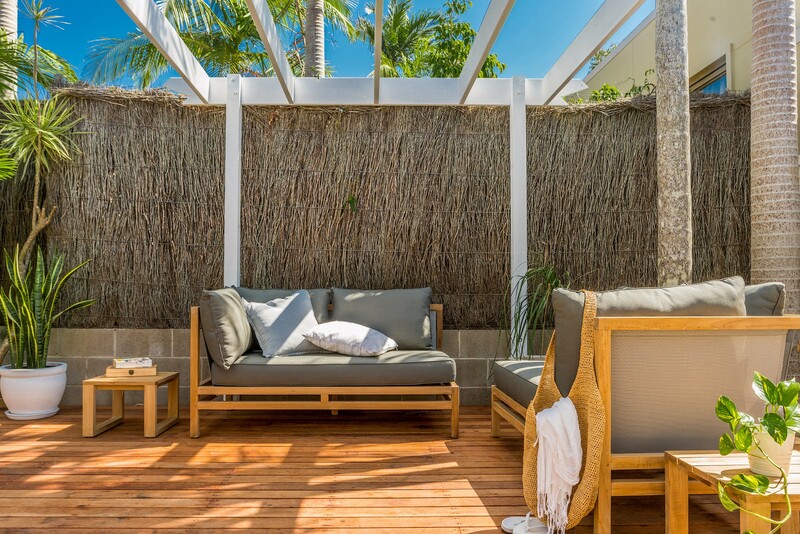 The spacious outdoor area is perfect for sipping sundowners, lingering over dinner or doing absolutely nothing at all! 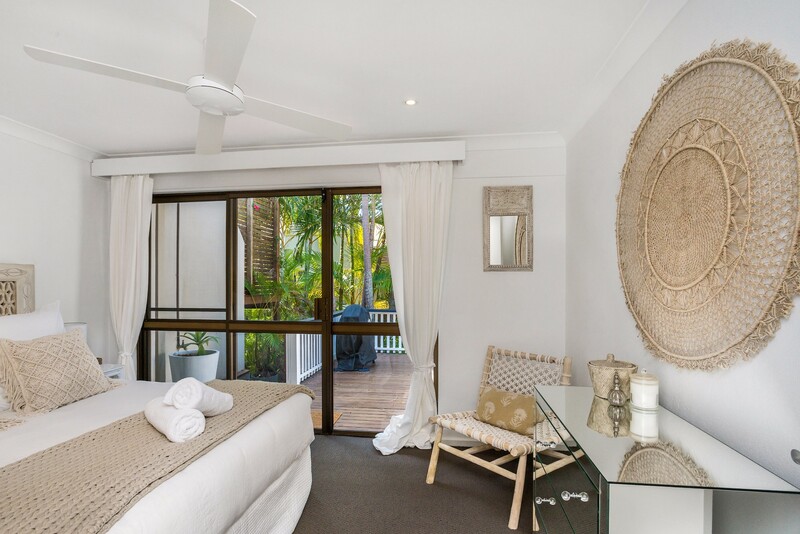 With 3 bedrooms to sleep 6, a family bathroom, outdoor shower and off-street parking, this ground floor apartment has all the hallmarks of a perfect family holiday home in Byron Bay. 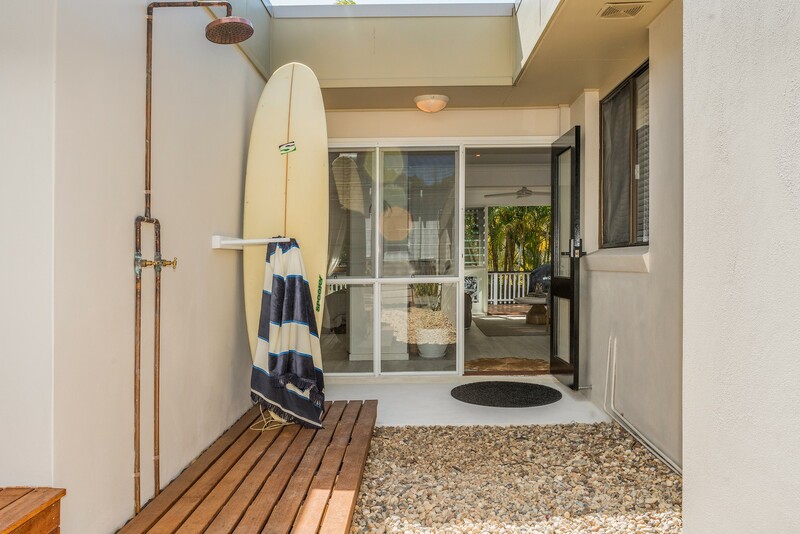 Leave the car behind and stroll 2 minutes to Clarkes Beach, or a little further into Byron Bay town. 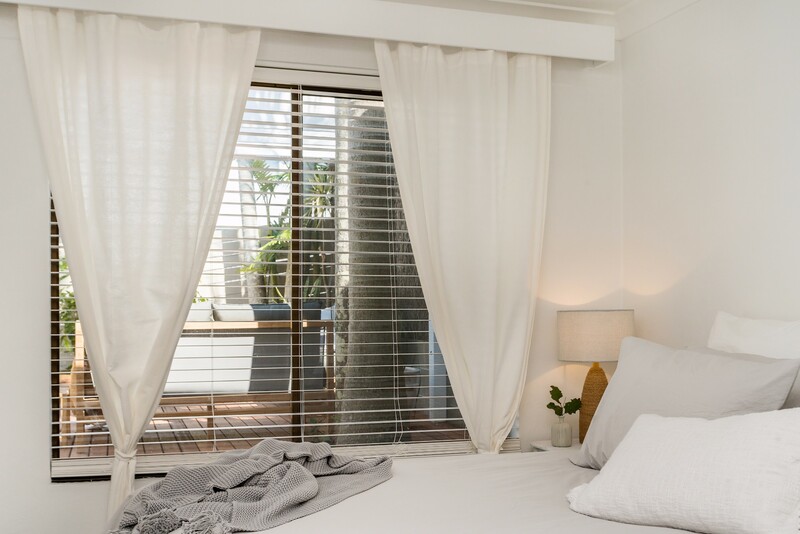 Cosy corner eateries such as the Beach Café and the Top Shop serve everything from chilled smoothies to full breakfast, lunch and dinner. Climb to the lighthouse or visit nearby Arakwal National Park where secluded Tallows Beach is perfect for surfing, sunbathing and and watching whales and dolphins that pass by. 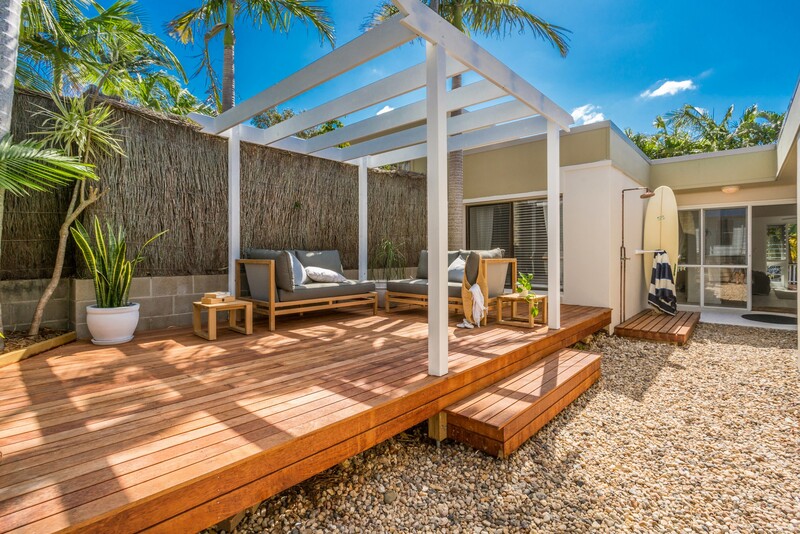 Designed for a seamless indoor-outdoor lifestyle, the open-plan living area has floor-to-ceiling windows and fully opening doors onto the generous furnished deck. 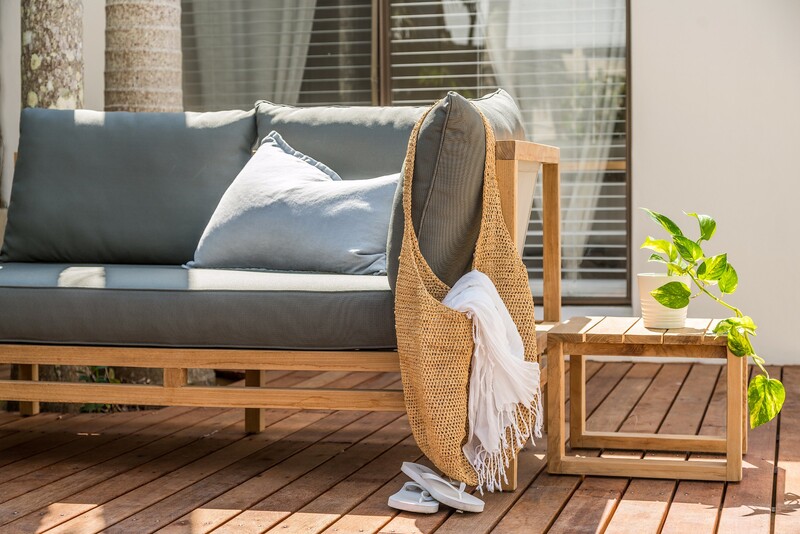 A sofa and armchairs are arranged around the TV which provides both Foxtel and Netflix for guest relaxation and entertainment. The breakfast/dining area adjoins the kitchen and has a wooden table and chairs for family dining. There is an additional sofa and TV in the bunk bedroom. Reverse cycle air conditioning will keep you cool throughout the steamy summer months. 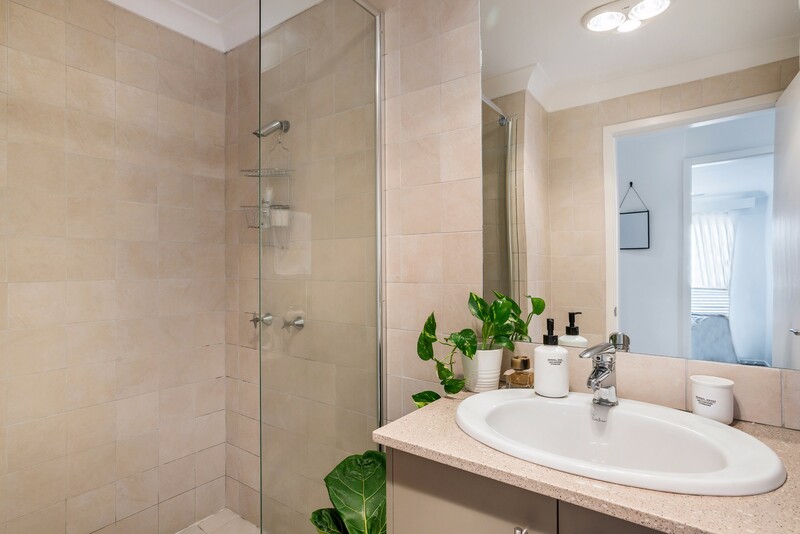 The galley kitchen is modern and fully equipped with stainless steel appliances including commercial espresso machine, oven, hob and extractor, microwave, dishwasher and family-sized fridge-freezer. A laundry with family sized washing machine, dryer, iron and ironing board is located next to the kitchen. 1 bedroom has ceiling fans and the master and third bunk room have air conditioning and TV's. They share the family bathroom which has a walk-in shower (no bath) and separate toilet. 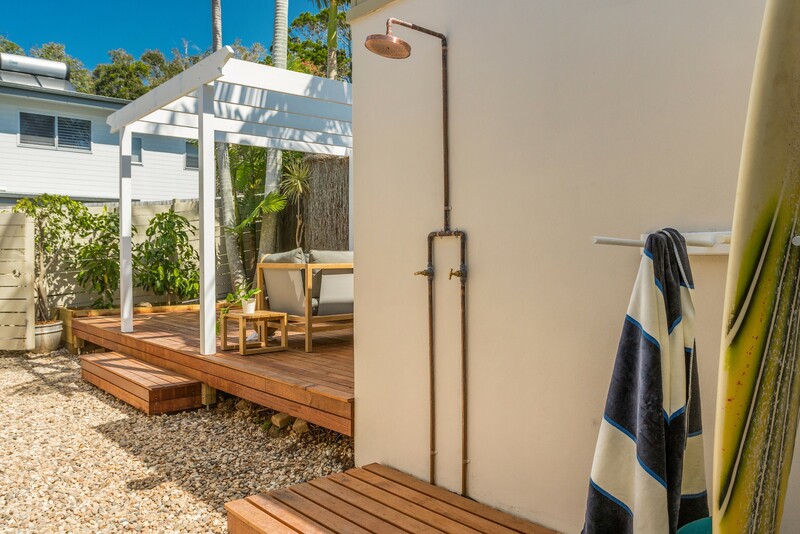 There’s an additional outdoor hot/cold shower. Master bedroom: 1 x queen bed with sliding door onto north facing deck. Banjo’s on Paterson has two outdoor areas for guest relaxation. 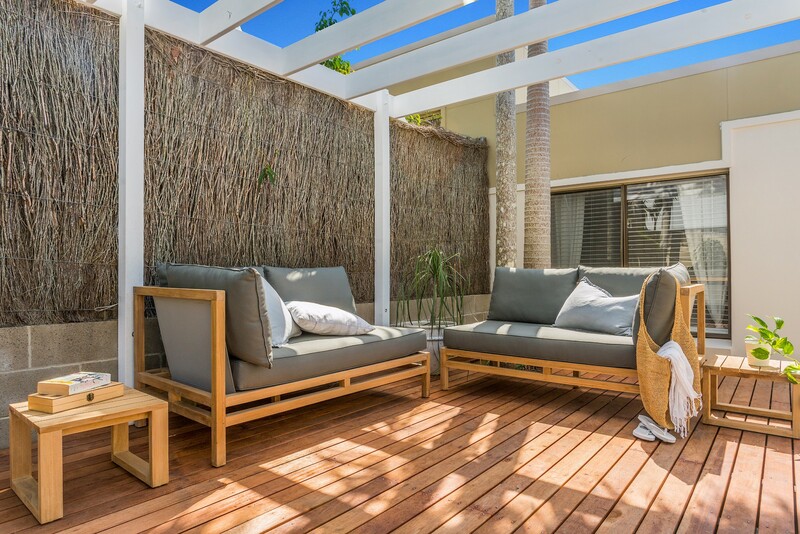 Enjoy the private courtyard garden and outdoor deck with comfy sofa beneath the shady pergola. 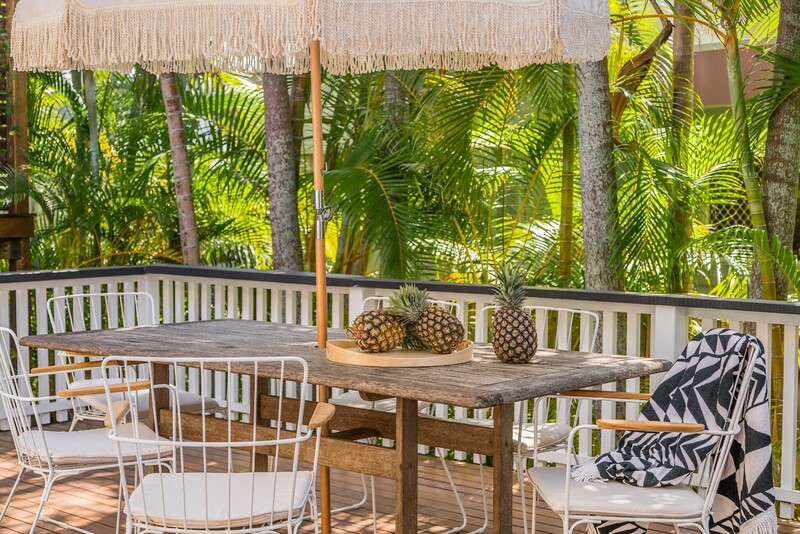 The north-facing back deck offers al fresco dining at the table for 6. 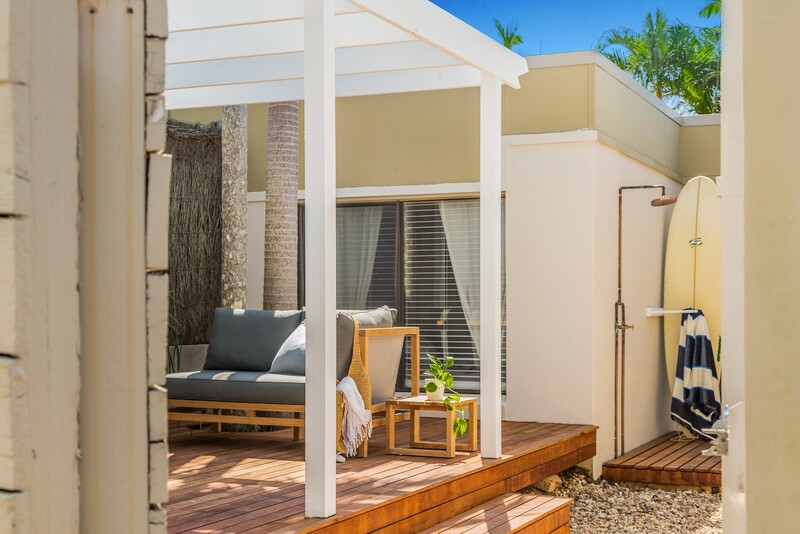 An outdoor hot and cold water shower is also provided for guest convenience - perfect for rinsing off sandy bodies and surfboards after a day at the beach. There is off-street parking for one car located in front of the apartment (no garage or carport available). 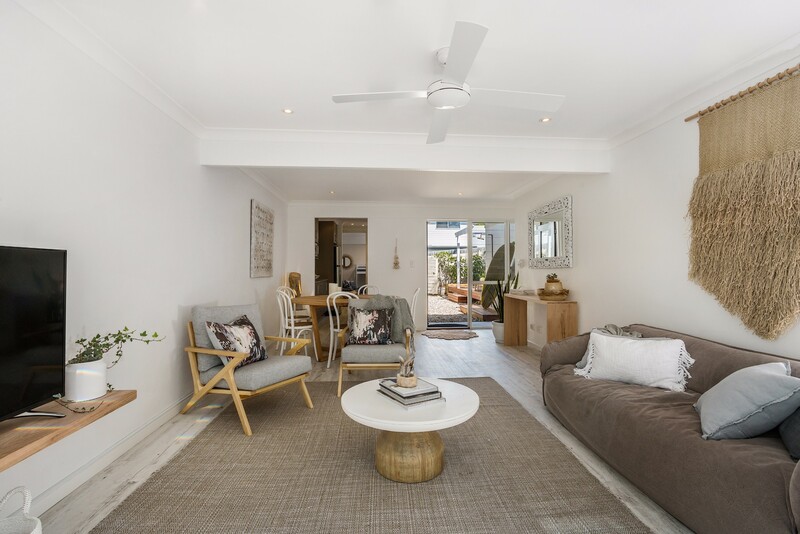 Banjo’s on Paterson is at the sought-after east end of the street, just 2 minutes’ walk from beautiful Clarkes Beach and close to The Pass and Tallows Beach. 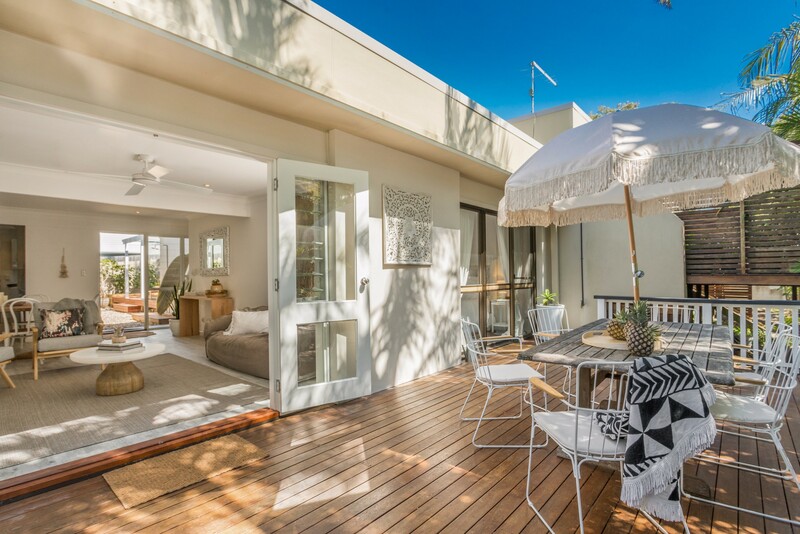 This prime Byron Bay holiday rental is equally convenient for walking to local cafés, an iconic part of this beach town. Casual dining and awesome breakfasts at The Beach Café and the Top Shop are a must! 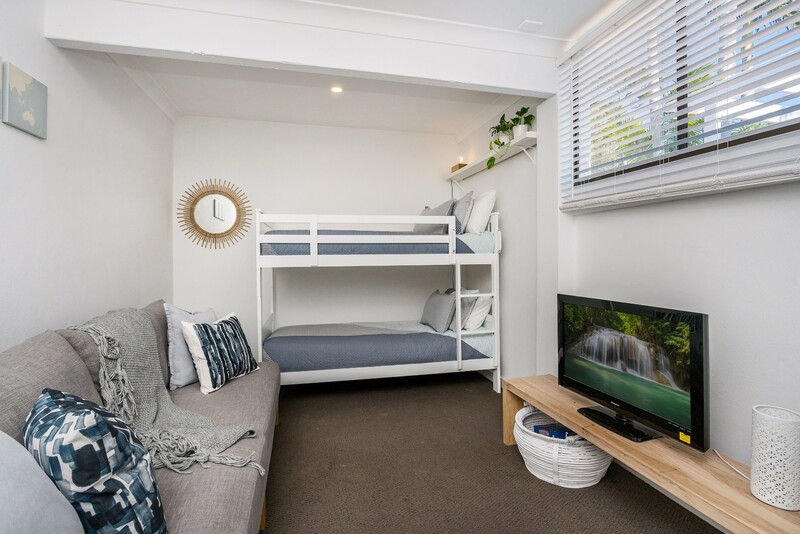 My family have recently enjoyed a week in Banjo's on Paterson which was wonderful, beautifully furnished and everything one could need on a beach holiday supplied. 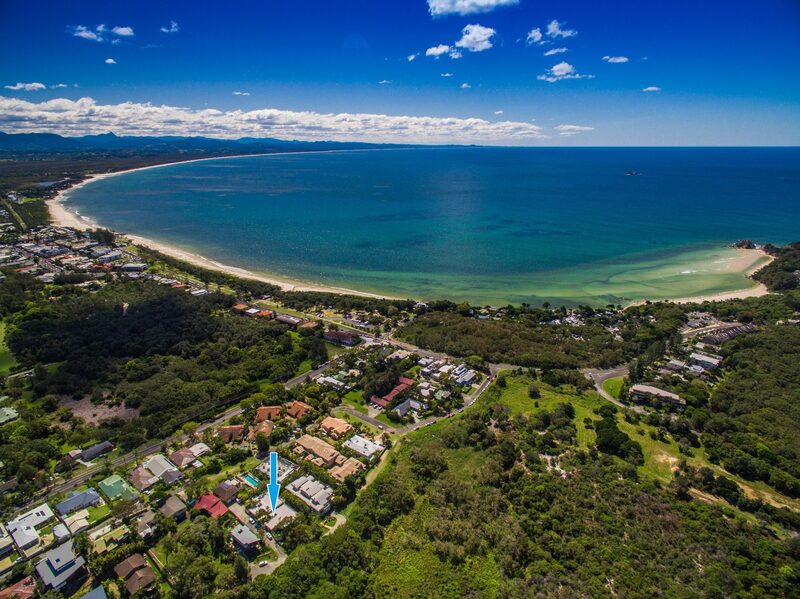 We just loved being in walking distance to the beaches as well as to Byron Bay. 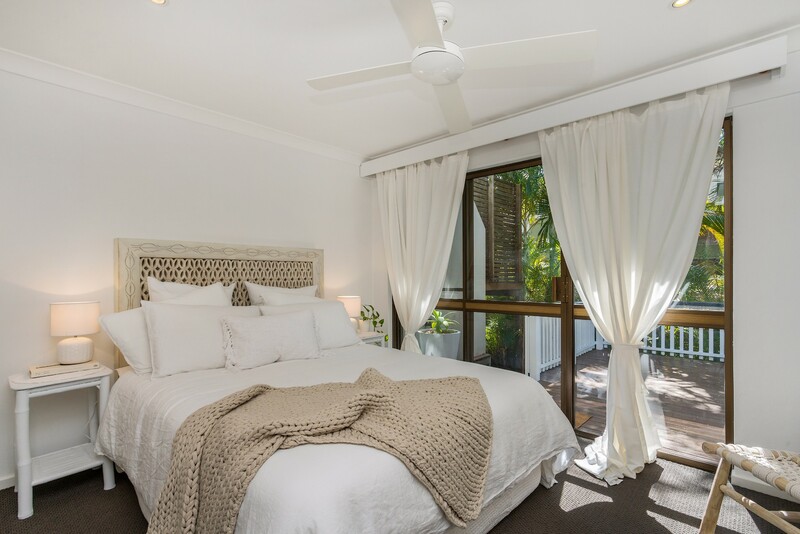 We loved the privacy and peacefull atmosphere of the place and we liked the interior of the house.